So over the spring break, I wrote a quick ~450 line C# program in order to learn the language. Within a day or two I had uScribble, an automatic screen-raster-renderer. To put it simply, it hijacks your mouse and draws things for you. Jumping from Java to C# was actually easier than I had thought. 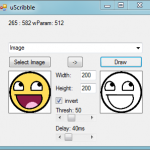 uScribble was basically a from-scratch copy of a similar Java application I had made in the past.